Elk Grove Girls Softball League Rules - View the ruiles of the game for each division. Volunteer Expectations Manual - For all managers, coaches, and volunteers. Accident/Incident Report Form - If any accidents or incidents should occur, complete this form and return to your division president. 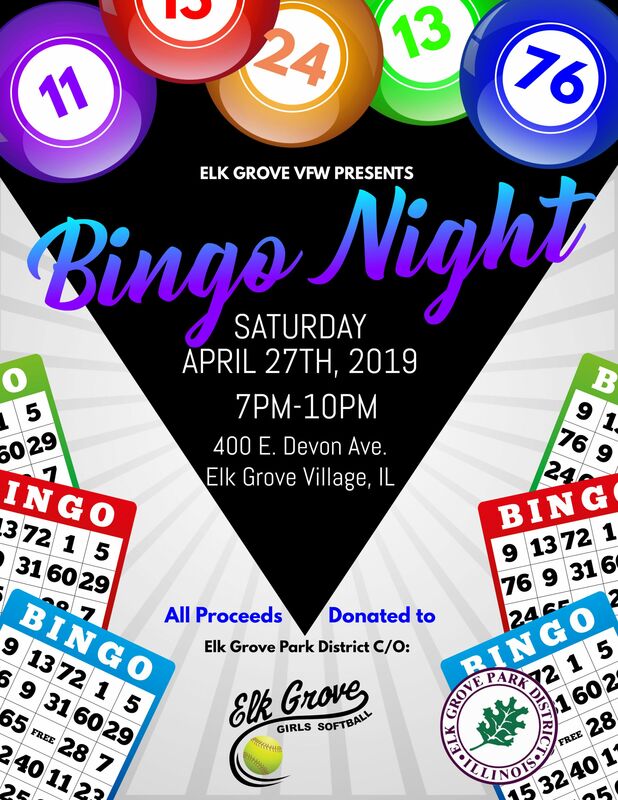 If you are interested in donating items for our raffle, please complete the donation form and contact Jackie Fuentes at eggswaysmeans@gmail.com or 847-909-0192. 2019 Spirit Wear available now! For more info, click the Spirit Wear tab at the left. We hope this finds all of you having had a restful and enjoyable Thanksgiving holiday with your families and having dug out from this weekend's snowstorm. We are reaching out to the EGGS Community today to let you know of some exciting changes for the program moving forward and also to address a couple of items that have been topics of public discussion recently. Think of it as an Elk Grove Girls Softball State of the Union if you will. The first priority for our program is to ensure that being a part of EGGS is a fun and rewarding experience for all of the girls. Right after having fun we do want to see all of the girls improve their skill level as the season progresses and we have often been asked by managers and families alike "are the girls at the level they should be at for their age". While there is no uniform answer to that question we are working to establish a set of performance goals for the girls in all divisions so that we have some way to measure their growth over the season. These goals will also be able to be used by Winter Training volunteers and the managers as teaching points to make sure that the girls are working on the right skills for each level and are better prepared for each season and advancement through our divisions. These will be informal in nature but our hope is that everyone will benefit from having a skill level guideline to work off of. We will be rolling these out at Winter Training and carrying them onto the regular season. As many managers have noted in recent years the basic playing rules handed out to them before the season are inconsistent and outdated. To rectify this issue, we have established a Rules Committee amongst our Board who has been charged with coming up with a uniform set of rules that will replace all other versions of them that are out there. The uniform rules should eliminate confusion and make for a smoother experience for everyone as well as align our rules closer to other programs in the area to make a smoother transition if necessary. Also, in 2019, we will be revamping our umpire training to ensure that our young people who umpire our games are put in the best possible position to succeed at their job and make the game more enjoyable and fair for the girls playing it. This has been a common critique of the program in recent seasons and we are committed to rectifying it to ensure everyone's continued enjoyment. Our board met with the Park District Board of Directors and amongst ourselves to discuss our options. During our meeting with the Park District it was made very clear to us by them that they do not envision any major changes in how our program is run and that the day to day management of the program would still be handled by our Board. The biggest change is that instead of our board operating with full autonomy we will now serve in an Advisory Board capacity where our decisions can be subject to greater Park District review and oversight if they see fit. There will also be some procedural changes to how we do things that will have no impact on the day to day operation of the program and should be invisible to the members of the program. We did discuss the option or taking the program independent from the Park District but ultimately the benefits of continuing our relationship with the Park District outweighed any potential benefits of breaking away. After a few weeks of discussion on the matter our Board voted 10-0 to formally merge EGGS with the Elk Grove Park District under a new Advisory Board Agreement. I want to strongly stress that we do not see this to be a "take over" by the Park District in any way, shape or form. Our Board asked many specific questions of the Park District and is confident that this will be a collaborative endeavor between us and them. While certain procedural aspects of our agreement remain fluid we are committed to working in good faith with the Park District to continue to run EGGS as it has always been run in the past. One of the biggest issues that we continue to grapple with is flat or declining enrollment in the program. As a Board we are being as proactive as possible on this issue and exploring different options to expand and enhance our program. One of the options we continue to explore is merging our program with other Park Districts or softball programs in the area. While our end of season survey indicated that merging with other associations would not negatively impact enrollment in the program our families were overwhelmingly opposed to traveling outside of a small area if we did merge. We continue to work diligently to find a balance to keep everyone happy. We know that a number of Elk Grove families participated in the Roselle Fall Ball League and while a lot of the feedback we received was positive there were some who did not enjoy the experience and have expressed reservations about merging with them full time. Merging with this group would also mean travel over 10 miles at times, including during the week and would require us to reshape our divisions to be sorted by birthday and not school year which would be a significant deviation from our current practices. Ultimately the Board decided this league was not the best fit for us at this time. We continue to reach out to other municipalities to gauge their interest in merging or at least adding a few games against other teams to break things up a little. We have reached out to Wood Dale/Itasca and Mount Prospect at this time and we will continue to explore these avenues and others. Continuing to grow the program to keep things fresh and exciting for the girls is a high priority for our Board and will continue to be. We also encourage all EGGS families to encourage other families in the Village with daughters to give softball a try as we would love nothing more than to see the program expand from within the community. Registration for Winter Training and the 2019 season is open at the Pavilion front desk. Our reduced registration rates for the 2019 season remain in effect until December 31. We encourage everyone to take full advantage of these rates and to please pass the word! Our program benefits greatly from tremendous volunteer support but even if you are unable to volunteer your feedback is ALWAYS welcome and appreciated. Our Board meetings are held on the third Tuesday of every month at 7:00pm at the Al Hattendorf Center and are always open to the public. If you have any questions or concerns about the program please feel free to join us. Also, our meeting minutes are always available on our website for your review. If you have any program specific questions you can always email Commissioner Nick Moser at eggscommissioner@gmail.com or any other board member. All board member contact information is available on the website. With that we wish all of you the happiest and healthiest of holiday seasons!